Ultimaker original UMO(+) adapter plate for UM2+ feeder by Tony84 is licensed under the Creative Commons - Attribution - Non-Commercial - Share Alike license. Easy printable and great looking adapter plate to mount an ultimaker 2 plus feeder to an ultimaker original (plus). In this solution you set the adapter plate between the plastic and metal part of the UM2+ feeder. 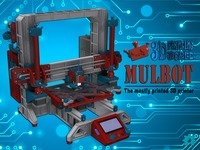 Because of this you can print in PLA (ABS isn't necessary) and no additional parts (like screws or nuts) are needed. I use it together with the feeder damper (https://www.thingiverse.com/thing:2723098). Both together worked really great. Say thanks by giving Tony84 a tip and help them continue to share amazing Things with the Thingiverse community. We're sure Tony84 would love a Tip, but unfortunately they have not setup their accounts to receive them yet.